Will a Third Term Help Bloomberg Make His Visions Real? Hudson Yards. The Javits Center expansion. The redevelopment of Coney Island. Willets Point. The renovation of Penn Station. The big ol' park on Governors Island. Atlantic Yards. All of these megaprojects are in various stages of success/failure, and even the solid ones could probably collapse without a moment's notice. Mayor Bloomberg's goal was to have all these projects so far along by the end of his second term that they couldn't be undone, and while that's now a pipe dream, would a third Bloomberg term guarantee megaproject success? That's the question Eliot Brown tackles in this week's Observer, and opinions are mixed. 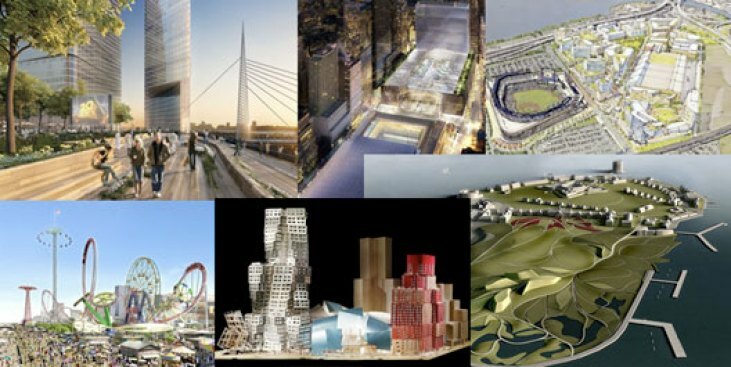 Some say four more Bloomyears would help the city execute the mayor's economic development plans, while setting the megaprojects up nicely for the next boom (yep, we're now officially in the era of awaiting "the next boom") and forcing stingy holdouts like Coney landowner Thor Equities to finally work with the city. But megaprojects take megabucks, and the belt is obviously tightening. Brown writes, "The total amount of city debt and obligations is slated to rise from $59 billion this year to more than $73 billion by 2011, according to city figures, and, should tax revenues fall, debt payments would take up a significantly larger portion of the budget. That, again, leaves less money for the big projects."